With iSkysoft Data Recovery, now anybody can recover data themselves, painlessly. Safe, complete data recovery is just a few clicks away: Scan, Preview and Recover. Using the latest powerful scanning algorithms, it can scan any Mac-based hard drive or external hard drive without destroying any data, and lets you recover data in no time at all. 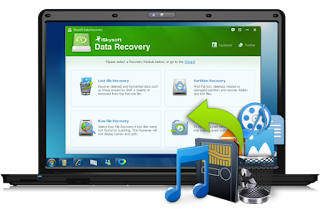 4 recovery modes cover virtually all data loss scenarios, such as accidental deletion, formatting, improper operation etc. • Wizard Mode Recovery - simply answer 2 easy questions and the rest of the recovery will be finished by the program. • Lost Data Recovery - Retrieve lost data emptied from your Trash bin or deleted by Command + Delete. • Partition Recovery - Recover data from lost, deleted, resized and corrupted partitions. • Resume Recovery - Save your scan results to perform data recovery later. • Recover almost any file, including but not limited to documents, photos, video, music, email, and archive files. • Recover from any internal and external hard drive, SD card, USB flash drive, digital camera, memory cards, iPod, media player and other portable devices. • Fully compatible with 10.8 (Mountain Lion), 10.7, 10.6 and 10.5. • Recover data from HFS+, HFSX, FAT16, FAT32, exFAT, and NTFS files systems. How do you know whether each recoverable file is exactly what you want? iSkysoft Data Recovery lets you preview lost files before they are recovered, help you recover data at your pace and quickly find the files you need. • View photos in thumbnail or cover flow view and easily check image quality before recovery. • Preview video and audio files to check whether or not they're what you are searching for. • Open documents, email and archive files to see they're intact and the ones you need. • Only scan files of the selected file type to save time. • Find your files in seconds with file filters and folder trees. • Easily distinguish valid and invalid files before data recovery. • Recover lost files complete with original file names and file folders.